Obon 2015 co-founder Rex Ziak at Monday's Returning Ceremony in Astoria, Oregon. The inscriptions on this flag handed over on Monday could provide clues to its original owner. Leslie 'Buck' Weatherill of Woodburn, Oregon, decided to return the good luck flag he collected on the battlefield. U.S. Army veteran Buck Weatherill shows off the good luck flag that he brought home from WWII. This is a picture of the man who carried the flag into war. Shigeyuki Yoneyama died in the Philippines at Zamboanga. Obon 2015 located several elder brothers of the fallen soldier. A nephew, left, accepted the flag on behalf of the family at Yamanashi Gokoku Shrine last year. U.S. Marines pose with a captured Japanese flag on Iwo Jima. Some aging veterans of World War II are embarking on one more mission. The object is to return Japanese flags taken as war souvenirs from Pacific battlefields. In some cases, wives or children are taking on the mission if the vet has passed away. Back in WWII, Woodburn, Oregon's Leslie "Buck" Weatherill fought across the beaches and jungles of Southeast Asia with the U.S. Army's 41st Infantry Division. After one bloody engagement late in the war, he says he and his comrades looked for souvenirs on the battlefield. "It was on a dead Japanese soldier,” Weatherill recalled. “The flag was in his pocket, sticking out. I took it off him." The Japanese flag Weatherill picked up measured about three feet by two feet. Calligraphy bedecked the white spaces around the red center... personal messages from the soldier's family and friends. This war prize was so common, it has an English name: a good luck flag. The Japanese name for "good luck flag" is yosegaki hinomaru, which literally translated means “group-written flag.” It was traditionally presented to a serviceman prior to his deployment. Seventy years later, Weatherill is 93 years old. At the suggestion of his daughters, he decided to try to return the captured memento to the dead soldier's family. "I just thought, the war is over. We're not enemies anymore, we're friends,” he said. “They should get the flag back." They did. And they're not the only ones. The Japanese consulates in Seattle, Portland and elsewhere have gotten dozens of inquiries from American veterans or their wives or children asking how to return war memorabilia. And now a Northwest-based nonprofit has sprung up. A Japanese-American couple from Naselle, Washington, Rex and Keiko Ziak, co-founded the group Obon 2015 to facilitate the return of flags. "Each one is in most cases the last surviving trace of that one individual,” Rex Ziak said. “Back home are wives, children, brothers and sisters who lost that person. Nothing ever came back." 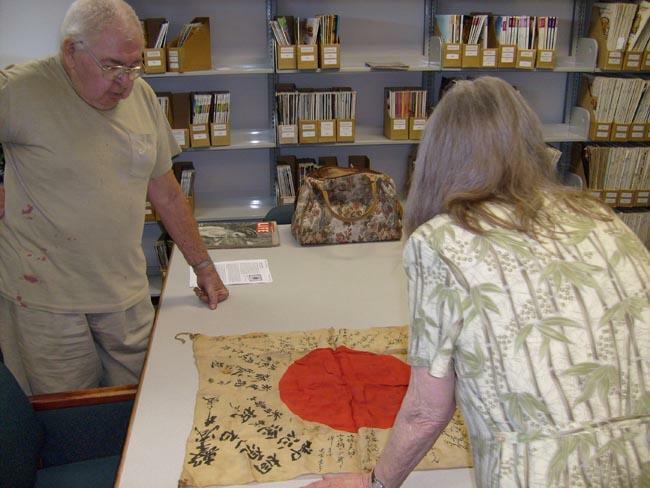 The Ziaks send the inscribed flags back with help from Japan. Scholars, government ministry workers, a veterans group and an association of Shinto priests pore over high resolution digital scans for clues. Rex Ziak compares the task to identifying the owner of a yearbook from the notes scribbled inside the cover -- seven decades later. Earlier this week, the Ziaks organized what they called a "returning ceremony" in the Northwest for first time. The emotional event took place at the old train depot in Astoria, Oregon, where once troops shipped out. WWII vets or their sons and daughters handed over five flags. "My mother and I present this yosegaki hinomaru to the Japanese people and hopefully to the return to the family," Jerry Bassett said before he choked up and had to pause momentarily to regain composure. The flag was among the possessions of Bassett's father, a Purple Heart recipient, who passed away last year. Keiko Ziak wiped away tears as she accepted the flags. It brings the number the nonprofit has received to nearly 100. Of those, original owner's families have been identified for about 25. The applause that greeted each handover might be the last recognition some of these donors will get. The rest of the repatriation process is usually confidential and some Japanese families don't want contact. A war memorabilia collector from Clarkston, Washington, said last year he was disappointed not to receive an acknowledgement of his returned flag. According to Keiko Ziak, the reappearance of these flags after such a long time provokes a wide range of reactions among relatives of the fallen. "On the Japanese side, they are shocked (at first) because they don't know that still exists to return to their family," she said. "Then secondly, they feel their father, or brother, are coming back home. They feel so overwhelmed - very powerful, spiritual and meaningful." Hiroshi Furusawa is the Japanese Consul General in Portland. He told the Americans at the returning ceremony that they were doing a "wonderful and honorable thing." "Your courage - their courage - did not end on the battlefield, but extends to this very day and beyond in the joy and profound emotional healing you help to bring to families in Japan,” Furusawa said. Several other speakers said the gesture of reconciliation is not just about a flag. They said the flag carries the spirit of its long gone owner home. In a later interview, Furusawa said a check of consulate records revealed a success rate of about 50 percent to reconnect war souvenirs offered back by Americans to an appropriate recipient in Japan. A consular officer at the Japanese consulate in Seattle provided a similar estimate for objects returned through government channels. Furusawa said it helps when the messages written on the good luck flag include the family name and hometown of the fallen serviceman and if the donor can remember the date and location of the battle where the memento was captured. The consul general said Americans occasionally also offer to return keepsake photos collected from the pockets or belongings of their former enemies. Rex Ziak, a historian and author by profession, said the significance of these war souvenirs sunk in for him when a Canadian memorabilia collector's son returned one of these banners to Japan. The flag originally belonged to Keiko's grandfather, which led to a moving reunion and sense of closure in 2007. Rex and Keiko married in 2009. The pair say the quest to reunite other families with these powerful mementos has occupied an increasing amount of their time ever since. Keiko Ziak said their fledgling nonprofit is focusing on the United States for now. But she hopes to expand globally eventually because the good luck flags have been carried, traded and sold around the world. "This is not just about Japan, not just about America," she said. Obon 2015 takes its name from the Japanese Buddhist summertime festival devoted to honoring the spirits of one's ancestors. A collector of World War II memorabilia has succeeded in a daunting quest thanks to help from the Japanese government. The veteran from Clarkston, Washington has found the right person to receive a Japanese war flag taken in battle nearly 70 years ago. Years ago, memorabilia collector George Koller bought an inscribed "good luck flag." It originally belonged to a Japanese fighter pilot killed in combat. Last year, Koller asked the Japanese consulate in Seattle for help to give the flag back.